Read an interview with Founding Editor Alex Albright in the 2002, 10th anniversary issue. Read the Editor's introduction to the redesign of NCLR in NCLR 2009. Read the Art Director's explanation of her redesign in NCLR 2009. 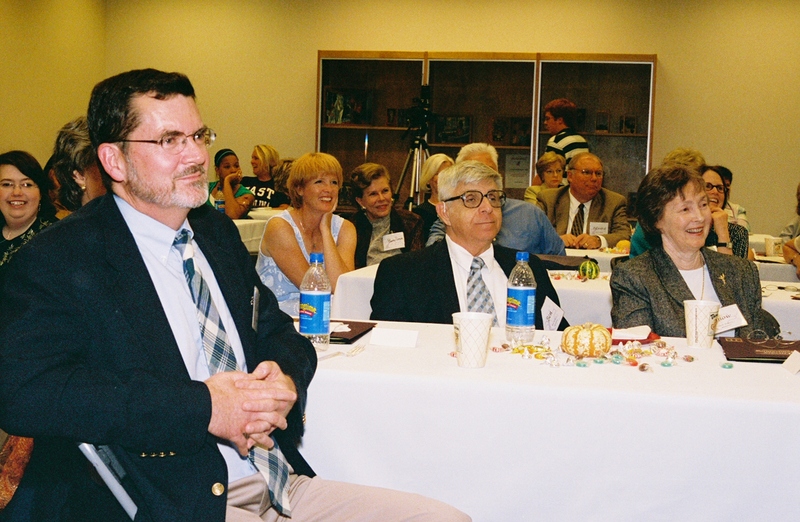 Ben and Snow Roberts at the Roberts Award ceremony, held at the 4th annual Eastern North Carolina Literary Homecoming in Joyner Library at ECU, Greenville, 28 Sept. 2007. The mission of the North Carolina Literary Review is to promote and support writers who are a part of our state’s rich literary tradition. NCLR not only introduces new and emerging writers, but also reintroduces forgotten authors, who have influenced the culture and history of the Old North State. We showcase their work in literary criticism, interviews, book reviews, fiction, creative nonfiction, poetry, and literary news stories, and complement the writing with the work of North Carolina artists and photographers. 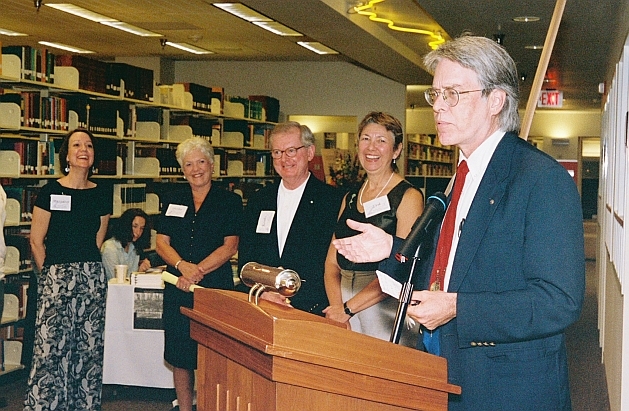 The first literary festival that Joyner Library hosted, in 2004, was the inspiration of Maury York, now the Assistant Director of Special Collections at Joyner Library, who wanted to recognize the generous gift from Snow and Ben Roberts of a large (over 1000 volumes) and amazingly inclusive collection of North Carolina fiction, which they had compiled from William Powell’s North Carolina Fiction, 1734-1957 and the supplement volume that took the list of fiction set in (or partially in) North Carolina to 1971. This collection has inspired Joyner’s North Carolina History and Fiction Digital Library as well, and my own students of North Carolina Literature use the volumes in the Roberts Collection to discover and introduce to each other writers from their home counties. So once again this year, I am pleased to express ECU’s appreciation of regular literary homecoming attendees Snow and Ben Roberts. At the 2nd Eastern North Carolina Literary Homecoming, Maury York began this tradition of presenting, named for these two generous people, the Roberts Award for Literary Inspiration, an award that would recognize significant, lifetime contributions to the literature of North Carolina. This award is sponsored by the Friends of Joyner Library, and the first Roberts Award went to David Stick. At that ceremony, Maury unveiled the plaque that was created by two students of ECU School of Art and Design’s renowned Professor Bob Ebendorf. Last year we added William Powell’s name as the second Roberts Award winner – quite the prestigious start for this award – high standards for future winners to measure up to. And this year’s co-winners of the Roberts Award do, indeed, measure up. I cannot express to you what a pleasure it is to have the opportunity to recognize three people whose vision became the North Carolina Literary Review. Long-time Executive Board member and past President of the North Carolina Literary and Historical Association, W. Keats Sparrow had a vision: a literary review to complement the association’s North Carolina Historical Review. Not only did he convince the Association to support this plan, but also he convinced them to allow East Carolina University, where he was then Dean of Arts and Sciences, to create and house the new publication. Keats returned from this board meeting in Raleigh and called in English Department Professor Alex Albright to talk about making this vision a reality. Alex set a high goal for himself of creating (quoting him) “a serious and entertaining magazine whose purpose is to explore and explain the connections four centuries of writers have had with North Carolina.” Among his numerous audacious acts as founding editor, Alex invited A.R. Ammons, internationally known poet who hails from right here in Eastern North Carolina to be NCLR’s “staff poet,” and poems by Ammons were published in every issue Alex edited. I have heard North Carolina Literature Award winner Michael Parker talk about Alex’s influence on his own writing as they prepared his early creative nonfiction for publication in NCLR. I’ve also heard state historians remark that the 1994 issue Alex published, which featured the 1898 Wilmington Race Riot, played a large part in calling attention to this historical event in time for it to be given a public forum on the 100th anniversary of its occurrence. The 1995 Black Mountain College issue continues to sell in bookstores and museums in Black Mountain, NC, today. In his interview for NCLR’s 10th anniversary issue in 2002, Alex noted that he would probably have created a typical text-heavy periodical that looked like most scholarly journals, with maybe a photograph per article placed neatly on a page by itself or two photographs on a page, if not for a call from Eva Roberts, a professor of graphic design in ECU’s School of Art and Design, who offered to help and who brought to the magazine its unique design element that ultimately won over a dozen design awards and the Best New Journal Award from the Council of Editors of Learned Journals during her tenure as Art Director and Alex’s as Editor. The first issue of NCLR was lauded by one reviewer as “everything you ever wanted out of a literary publication but never dared to demand.” Another remarked that “the only bad thing to say about the first [issue] is that it seems almost too good. If the editors and writers can keep this up . . . they will have given a very definite gift to the state’s readers.” – Indeed! Alex tells the story of being at a meeting in Raleigh where the then new North Carolina Literary Review was recognized, and someone remarked, “and you know, this magazine comes out of all places, East Carolina.” We’re here this weekend because we, thanks largely to people like Alex Albright and Keats Sparrow, know of the cultural, historical, and literary riches of this region, riches that our friends and family from other regions are not so aware of, so I think it is particularly appropriate this year of the 100th anniversary of East Carolina University and at this occasion of celebrating Eastern North Carolina literature, that we honor the significant literary contribution to North Carolina Literature – the whole state – made by W. Keats Sparrow, Alex Albright, and Eva Roberts, the creators of what has been called “the state’s literary journal of record” that is the North Carolina Literary Review. Left to right: NCLR Editor Margaret Bauer, Friends of the Joyner Library President Shelby Strother, Roberts winners Keats Sparrow, Eva Roberts, and Alex Albright.